The Necchi EX100 is an extraordinary sewing machine. It features an award winning design, advanced sewing features and lots of standard accessories at a great price. This is the top of the line for the Necchi EX series sewing machines. Built with all types of sewers in mind this sewing machine will allow the user to easily handle a variety of sewing projects from garment construction to home decoration to quilting. There are 100 built-in stitches with direct stitch selection to choose from. Use the push button keys and backlit LCD display screen to choose from the many decorative, utility or 6 different one step buttonhole styles. The EX100 has auto-lock stitch, automatic thread cutter and needle up/down buttons right on the front of the machine making piecing quilt blocks simple and easy. Quilters will also appreciate features like an 8.6” x 6.7” sewing bed, knee lifter, extra-high presser foot lift, and large 16” X 11” extension table when working with their quilts. Drop the feed dogs for free motion stitching and use the 3 level Optic magnifier to see your work more easily. Use the Start/Stop button and be completely free of the foot control. These great features help you to keep both hands on your quilt and maneuver it easily while sewing. This sewing machine has a top-loading bobbin system and Auto-declutch bobbin winding. The built-in needle threader makes theading the needle a snap. The Instruction Book is illustrated and easy to read. A hard cover is also included to protect your machine and help keep it dust free when not in use. 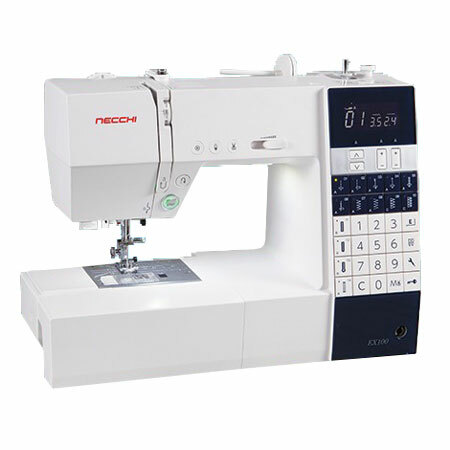 You’ll enjoy sewing with your Necchi EX100 – It’s fully loaded and perfectly priced to meet all your sewing needs. This Necchi EX100 includes FREE even feed and darning feet. These are not packed with the machine by Necchi. We are offering them as a promotion.